Implosions are the safest, most preferred for demolishing old buildings to make way for new. The process is designed to have low impact so that any other structures around the blast radiance don’t lose their integrity. In college football, implosions are meant to describe teams that simply can’t get out of their own way and the consequence of those losses usually have maximum impact. These teams that are described as such are usually favored before said “implosion.” Four weeks ago, Alabama and Auburn were written about as the toast of the SEC before playing a single down. The Crimson Tide were still a proven institution for boa constrictor football while the Tigers were deemed unstoppable with the hire of Will Muschamp and the hype beasts around Jeremy Johnson. Saturday’s results for the two teams against Ole Miss and LSU shifted the conversation about the balance of power in the SEC West. In Auburn’s first two games, they were a team that went from pretty good against Louisville to BASURA against Jacksonville State. Jeremy Johnson threw three interceptions against the Cardinals while also gift wrapping another two to the Gamecocks. Muschamp inherited the problems against the running game that Auburn had dealt with in 2014; Louisville and Jacksonville State racked up a combined total of 399 rushing yards. It seemed inevitable that the Tigers would take a big L once in conference play but the question lingered as to who would deliver. That answered was delivered by Leonard Fournette of LSU who ran for 228 yards and three touchdowns. Fournette, in the process, managed to set a new school record averaging 12 yards per carry in a single game. He also managed to brush off Tiger defenders as if they were the rubble of Auburn’s AP ranking. To say Auburn imploded though is doing a disservice to LSU, the Tigers absolutely bulldozed Auburn in order to make room for a fun, new Cajun and Creole restaurant. The crater left around Auburn by the ground game of LSU is glaring mostly because of the stories surrounding this team’s potential. The Tigers were seen as an easy pick for the playoff but they look like a shell of that preseason expectation. The road for a rebound doesn’t look any easier despite a favorable schedule at home. Next week, they play a Mississippi State team that was able to bottle Fournette better than Auburn and has a scrambling Dak Prescott that can cause fits for the Tigers. They also have to play both a feisty Kentucky team and a Texas A&M that’s stacked with murderous defensive linemen on the road. This doesn’t even include visiting challenges from back-to-back Alabama slayers Ole Miss and ‘Bama itself. Of course, Gus Malzahn and his staff can always right the ship in time for another decent season but, at this point, it’s not unfair to say that this team can sink into lows unseen since their last head coach. Meanwhile, their rivals in Tuscaloosa just lost a consecutive game to Ole Miss. 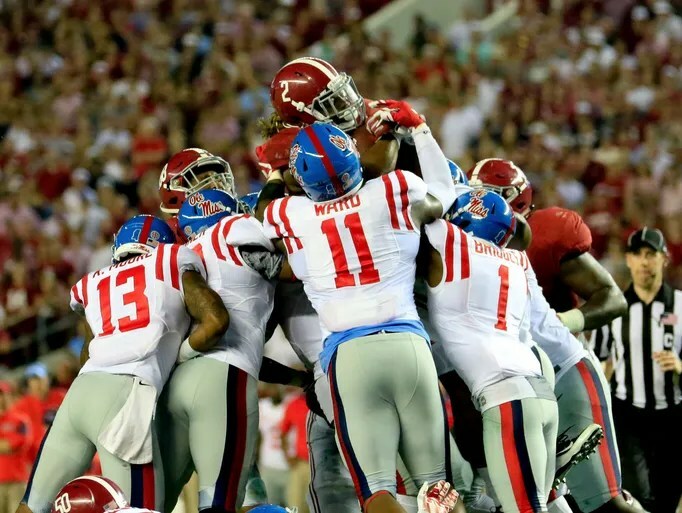 This is the first time the Rebels have beaten Alabama in back-to-back seasons. It’s also the first time they have won at Bryant-Denny Stadium since 1988. That’s 27 years of home dominance for Alabama in a series that has been so lopsided in the Tide’s favor you can imagine an elephant sitting on a scale. Ole Miss’ 43-37 win over Alabama suggests that the elephant tipping the scales is losing a tiny bit of water weight. The Rebels put up a dominating performance through three quarters that looked all but finished going into the fourth. They were able to score 21 points on four out of five Tide turnovers. Both Alabama QBs were error prone on the evening with Jake Coker turning in two interceptions while a short lived entrance of Cooper Bateman resulted in one. Ole Miss was able to shut down most of the long lobs down field from Coker. They also benefited from Lane Kiffin completely forgetting about RB Derrick Henry being a threat until there was seven minutes left in the game. The game changer for everything happened when Rebel QB Chad Kelly jumped up for a botched snap, had two defenders in his face and launched the ball to WR Laquon Treadwell. The catch bounced off of a Tide defender’s helmet and into the hands of WR Quincy Adeboyejo who ran all the way into the end zone to put Ole Miss up 24-10 in the third quarter. Before this game, Nick Saban’s home record in eight years as the head coach of Alabama has been 30-5. His tenure has made Bryant-Denny Stadium the most vicious environment in the SEC. The crowd at the stadium is always fierce with a fervor that recalls a religious revival. Yet, after the Johnny Manziel-like play from Kelly, the atmosphere went from raucous to funereal. There were fans that were emptying out of the stadium in the third quarter as if the game was already won, a rare sight in college football. Yet, the Tide stormed back and scored two touchdowns in three minutes and forty seconds; a comeback that was indicative of the Universal Law of Alabama with Too Much Time. The law did not hold and that was due to failure in quarterback play when Coker threw an interception to seal the win for Ole Miss. The good news for Alabama is that the loss is not the end of the world despite what certain think pieces have to say. It’s great to take in all the wonderful sights that result when Alabama loses in this fashion but, at the end of the day, it’s not the final. If they run through the rest of their schedule, they have the name brand and the perception among Playoff voters to move them into the top four spots. At the same time, they are going to be traveling to Georgia, Texas A&M, and Mississippi State, teams that all possess offensive weapons that will test the weakest parts of their defense. They are still a team that needed five turnovers to be put to rest. It could be much, much worse for the Tide: they could be Auburn. One of college football’s most alluring aspects is you never know what you’re going to get from week-to-week. There is always a chance for a team to get beaten in the most inexplicable ways. Sure, you could make the same argument for the NFL but the NFL is where all the top talent plays. The NFL doesn’t have Appalachian State beating Michigan in the Big House or Oklahoma running a buzz saw through Alabama in the Sugar Bowl. The team with more talent can be beat in ways that defy pregame prognostication. That’s exactly what happened when Stanford morphed into a team with a competent offense in the Los Angeles Coliseum against USC. In the Cardinal’s first two games of the season, their inability to score in the red zone was a giant Achilles heel. At Northwestern, they were held to zero touchdowns despite being in the red zone three times. Their next game against UCF yielded two touchdowns in the red zone despite traveling there four times. Combine this with a 3rd down conversion efficiency rate of 20% and 40% in each respective game and the Cardinal looked set for their second loss of the season against a sixth ranked Trojans team. Instead, the Trojan defense collapsed and gave up 5 touchdowns out of the six times that Stanford was in the red zone in a game that looked more Spaghetti western than the corporate training video of a game in 2014. The Trojans’ explosive offense was on a roll for much of the game with Cody Kessler throwing 25 of 32 passes for 272 yards and three touchdowns. It would stall later after a third quarter touchdown with 10:08. USC would only score three more points before allowing the Cardinal to score a field goal to widen their margin to 10 points at 41-31 with a little over two minutes left. The ensuing drive by the Trojans was shutdown by the young Stanford secondary with the final Trojan plays resulting in three subsequent incompletions by Kessler. While Stanford’s defense staved off a final comeback, it’s really the offense that won the day. Which begs the question: has Stanford’s talented offense been hiding the whole time or is USC’s defense just that bad? For a team that had incredibly bad red zone efficiency against Northwestern AND UCF, the answer seems to be the Trojan defense. They gave up plays over 20 yards long to four members of the Stanford receiving corps; the highest recorded was a 41 yard reception from Francis Owusu. They also gave up 279 yards on 18 of 23 attempts for two touchdowns to Kevin Hogan. The quarterback ended the game with an average of 12.1 yards per passing attempt while Northwestern was able to hold Hogan to just an average of 4.4 yards per passing attempt. Stanford clearly took advantage of the gaping holes in USC’s defense and now the Trojans have to regroup before next week against Arizona State. The rest of the Pac-12 South division is also waiting restlessly for a chance to pounce on an incredibly hyped team that showed promise in their out-of-conference games but now look like a sitting duck. Georgia Tech and Notre Dame offered an abundance of hate leading up to its 3:30 kickoff. The story lines regarding Paul Johnson and Brian VanGorder’s history around Georgia Southern were a major talking point leading into the afternoon. The assumption was that Johnson was going to run it at VanGorder’s Irish defense and make him pay for past comments about the triple option’s conservative architecture. Johnson was proved wrong when Notre Dame stuffed the Yellow Jackets for the majority of the game. The most remarkable part about all of it was winning despite looking like an infirmary after an early game knee injury to DB Drue Tranquill added another name to the injury list. The Irish held Georgia Tech to seven points through three quarters even with two turnovers that were the result of a Deshone Kizer interception and a fumble. The Yellow Jackets came bounding back in the final seconds of the game but VanGorder’s defense held victory away as if it were Lucy from The Peanuts. The Irish trotted away with a 30-22 walk in the park, the biggest task of which was avoiding the hateful stares of the grumpy guy on the park bench. I have spent the past two weeks trying to discredit Notre Dame as nothing more than a team who gets the benefit of the doubt from journalists who are still nostalgic for the team’s halcyon years¹. Upon closer inspection, the team is not just newspaper fluff. If they were at full health, I’d rank them as a serious contender. But, a part of me is still incredibly skeptical about their chances at the top four with a squad that seems to be made entirely of papier mâché. In two weeks, they play Clemson in Death Valley with another chance to prove that they are sustainable in their current form. Until then, I think Notre Dame is all set for a great season at 9-3. Ohio State struggled MIGHTILY with Northern Illinois in a 20-13 squeaker. The high octane Ohio State offense was turnover ridden and was as sloppy as a plate of Skyline chili. The total offensive output for the Buckeyes was just shy of 300 yards with only two touchdowns to boot. In a repeat year, the name of the game is survive and advance but Ohio State looked like 2014 Florida State’s high wire act for four quarters. Georgia fans can breathe a little bit. They managed to beat the one wild card that always upends any expectations for their season in a 52-20 blowout. After a week of talk about Steve Spurrier’s last four wins out of five tries against the Bulldogs, people began to wonder aloud if this was just natural. Was Georgia fatally flawed against Spurrier even when they had a better team? This past weekend proved that they were not as Bulldog RB Nick Chubb rushed for 159 yards and two touchdowns through the Spurrier mystique. We have seen the SEC East become a game of Plinko in the past two years that has landed improbably in the Mizzou box. This year, Georgia looks like it can control the game with only a few pegs standing in the way. Clemson escaped Louisville in a dreadfully ugly 20-17 game at Papa John’s Stadium. DeShaun Watson threw two interceptions in the game; Watson only threw two interceptions in 2014. The Tigers were unbalanced and thrown off repeatedly due to injuries to starting RT Joe Gore and second string RT Jake Fruhmorgen that left the offensive line a little shaky. The game ultimately ended on a Clemson interception from a last second drive to the end zone by Louisville to put Bobby Petrino at 0-3. Dabo Swinney celebrated Clemson’s near-catastrophe by dancing as if he were on a Today Show segment. Missouri almost lost to Connecticut but didn’t in a 9-6 pass, punt and kick contest. Their win means they will not be champions of the SEC East this year. UCLA’s winning streak with frosh QB Josh Rosen was almost snapped by BYU after Rosen posted three interceptions. Yet, the tables were turned and the Cougars ended up on the receiving end of a final comeback that was fueled by Rosen and RB Paul Perkins. The Bruins were able to put BYU away and advance with a 24-23 victory. This game was evidence that freshmen – no matter their potential – are always prone to mistakes. Patrick Mahomes threw for 243 yards, a touchdown and two interceptions in a 35-24 shootout between Texas Tech and Arkansas. He also ran for two more touchdowns to lift the Red Raiders past Arkansas’ heavy cosmic tragedy. The final drive by the Razorbacks ended when prolific RB Alex Collins was stripped by Jah’Shawn Johnson to end the game. In the post game press conference, Texas Tech head coach Kliff Kingsbury had plenty to say about Bret Bielema’s brash comments regarding the air raid. We shall now anoint Kingsbury as the Clapback King. Texas is a complete and utter mess. After firing AD Steve Patterson earlier in the week, the Longhorns missed a PAT to tie with the California Golden Bears. Charlie Strong’s team is now 1-2 and conference play begins next week at Darrell K. Royal Stadium against the shruggie emoji known as Oklahoma State. ¹Notre Dame still receives their fair amount of fawning from major media outlets in the Midwest and the Northeast. But, this year the early season hype is actually warranted.